You Purchase the Products, and We'll Handle the Rest! FBA Express understands that a monthly membership may not be affordable for everyone. That is why we have created our FBA Express Pay As You Go Plan. 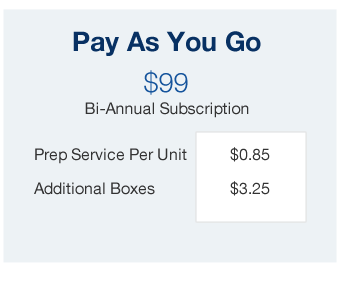 This bi-annual subscription allows you the seller to send FBA Express as little or as many products as you want at a fixed price of $0.85 per unit. The $0.85 covers your inspection, labeling and any prep service needed for your FBA order. Please see the fee breakdown below. 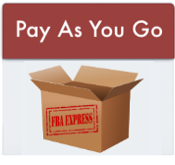 FBA Express charge $15.00 per pallet for all of our service plans. Please contact us for more information. By paying today you Agree to the FBA EXPRESS Terms and Conditions. International Customers: Please use the 'Checkout with PayPal' option. Purchase the plan you want quickly and easily so you can start saving money today! Copyright © 2016-2019 FBA EXPRESS. All rights reserved.